Smart Grid Tie inverter is a compact unit,which directly converts direct current into alternating current for powering appliances and/or office equipments and connecting to utility grid.The AC output from Smart Micro inverter is synchronized and in-phase with the utility grid.It is a key device of power generation systems such as PV power generation system. Smart Micro inverter specially optimized design to work with modularization of DC power supplies which includes the mainstream solar modules,18V(36cells),24V(60 cells) and 36V (72cells)Moncrystal and/or polycrystalline solar panels and batteries.Smart Micro inverters are stabliation,reliable and high conversion efficiency items.It is the best choice for PV power generation system. Smart Micro inverter can be easily placed and attached to the rack underneath of PV module.No need sapces for independent installation and low voltage DC wre connects from the PV module to smart Micro inverter can eliminate the risk of high DC voltage.Distributed modularization design philosophy for smart micro inverter insures the productiveness of the whole system and will not affect by a single point of failure.Each Smart Micro inverter is individually connected to each PV module in the array.This unique configuation means that an individual Maximum Peak Power Point Tracker(MPPT) controls each PV modules in the array which may be affected by shading,soiling,orientation or mismatch,etc. Smart Micro inverter insures top performance for maximizing energy production from the whole PV system and gets return on investment in less time. 1.Unique circuit design,choice of import industrial electronic components,higher efficiency,more stable performance. 2.Creative MPPT technology,efficiency more than 99%,faster and more sensitive reaction,more reliable. 3.Parallel type design for DC input and modularization design for inverter,small volume,distributed installation easy for system configuration,flexible for combination,strong expansibility of system. 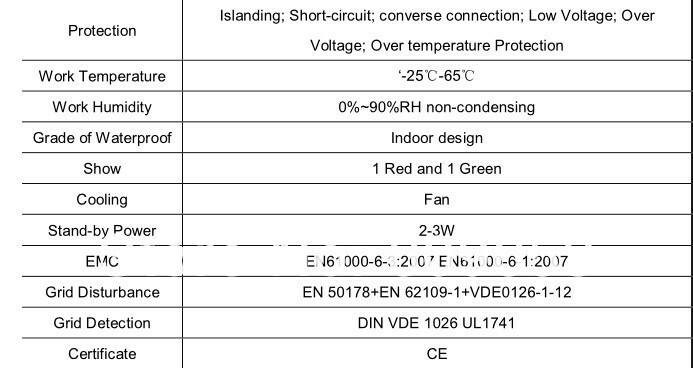 4.Adopting high-frequency isolation transformer type,high efficiency,and high security. 6.Aluminum alloy housing,not rust,heat-resisting and cold-resistant as well as anti-corrosion. 7.Getting electronic circuit design,apperance design and other core technology Patents. 1. Red terminal: Connect DC positive, black terminal: Connect DC negative. Shown in Figure 1. 3PIN AC outlet. Are shown in Figure 2. 3. Switch: properly connected; turn on the switch, the inverter to work. In order to achieve higher power use requirements, the use of this product can be stacked, such as: 4 grid inverter 300W of stack used is equal to 1200W, and the number of open stacks(No Quantitative Restrictions). And inverter will be automatically restart up when the temperature of body of the inverter down to 40-50.
d. Power grid fault protection (when 110VAC or 220VAC grid power outage and/or tripped. e. Islanding protection: inverter will be automatically shut down for power output when disconnect with power grid. Warranty Period: 15-year limited warranty period. Warranty Evidence: The B/L, Product(s) series number(s), Product(s) model, and a completed warranty card. If your device has a defect or malfunction during the warranty period, please contact your retailer or installer. the AC grid before disconnecting the Smart Microinverter from the PV module when remove the inverter from the rack. contact customer support to return the Microinverter and initiate for replacement process. Features:l High performance maximum power point tracking (MPPT)l Reverse power transmissionl Intelli..